Uncharted 4: A Thief's End is the highly anticipated action-adventure game for PS4. Produced by Naughty Dog, the new title promises jaw-dropping graphics, top notch gameplay and more of the unforgettable adventures of Nathan Drake and his brother Sam. The game has scheduled for release on March 18, 2016. The game is set three years after Drake's Deception, the third and latest production of the franchise, released for the PlayStation 3 in 2011. The new title was first revealed in November 2013 in a short teaser, which even showed some character or gameplay scenes. One of the conference highlights Sony at E3 2014, the title won the first big trailer, this time with the presence of Nathan Drake, represented by quite realistic and advanced graphics. When compared side by side with older versions of the game, the superiority is evident. In early 2015, the Naughy Dog decided to tease the fans with bit more information about the title. According to the developer, Drake's brother will play an important role in the new game, and will rival the protagonist during the primary campaign. Part of the plot was also revealed by the company. After rediscovering his brother Sam, before presumed dead, Nathan goes in search of treasure, located in the mythical colony of Madagascar. It was unclear whether this will be the unique setting of the game campaign. According to yet Naughty Dog, the game will maintain the same linear size, but this time with higher setting, and allow the exploration of new locations. Another good news was the announcement of the presence of a multiplayer mode, which returns after a successful appearance in Uncharted 3. It was officially announced for release in 2015, exclusive to PlayStation 4 but was postponed to 2016. You can now pre order the game through the PlayStation Store for the price of US$ 59.99. A deluxe version with DLC and additional content is also available, for the cost of US$ 79.99. The title was once again presented at E3 in 2015, with a beautiful gameplay. Despite some technical problems while viewing the impressed video with amazing graphics and exciting action sequences. The video footage showed, Drake exchange fire with enemies and drive a jeep at high speed through narrow and busy streets. Recently, The Thief's End also revealed details of the collector’s edition. 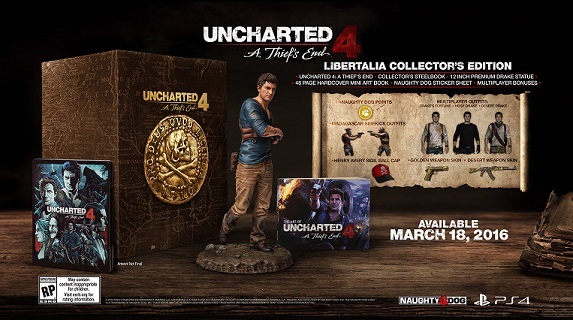 Among the special items: an art book with 48 pages, exclusive sigil sticker sheet, codes with Naughty Dog Points (kind of currency to unlock additional multiplayer content), alternate costumes, new weapons and an incredible Drake statue of 30 cm.